It was Nov. 21, 2010, when Lance Cpls. 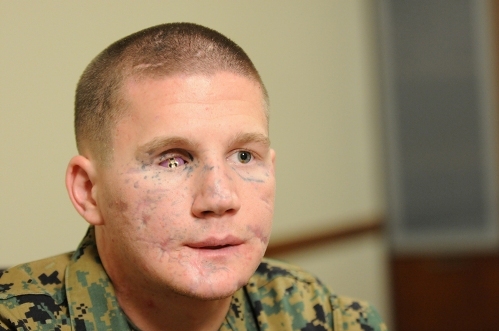 Kyle Carpenter and Nick Eufrazio were rocked with a grenade blast that changed both of their lives. Nineteen months later, Carpenter’s miraculous recovery continues. Profiled in a Marine Corps Times cover story I wrote late last year, he has continued to heal slowly from life threatening injuries. The blast mangled his jaw, destroyed one of his eyes and most of his teeth and caused severe trauma to his right arm, which had severe tissue damage and more than 30 fractures. Carpenter has been strikingly open about his recovery since, launching a Facebook page called Operation Kyle tracking his recovery. Last night, Carpenter’s family announced on the page that he has been promoted to corporal. It comes after more than 30 surgeries, and 19 months after he was left barely clinging to life. It’s unclear where his rumored case for the Medal of Honor stands, but Marines who were nearby outside Marjah, Afghanistan, the day he was wounded maintain that Carpenter shielded Eufrazio from most of the grenade blast. Eufrazio, meanwhile, is on his own slow road to recovery after suffering a traumatic brain injury. In a December feature in a Massachusetts newspaper, his family said the Marine had started to greet visitors by name in the hospital. Semper Fi, Warriors! May God bless both of you and your families! Kyle is a hero to thousands around the world. I was never wounded so severely but the ultimate test, I think, is to come home, take off your uniform, and carry on with your new life. Now your bravery will be tested every single day, hour by hour, with everyone watching, and there will be NO reprieve. That is why I wish to God it could be different, but I find these Wounded Warriers such a fantastic source of strength and resolve. Thank you, trooper, and Semper Fi!